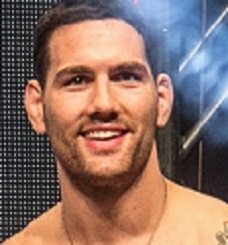 Chris “All American” Weidman was born in Baldwin, New York on the 17th of June 1984. He is a mixed martial artist that competes in the UFC. He is the former middleweight champion of the UFC and was the one who ended Anderson Silvas reign in the division. He defended the title three times and has a black belt in BJJ from Renzo Gracie and Matt Serra. As a youngster Chris and his brother was involved in several sports. He started wrestling at an early age and his natural athleticism helped him master it quickly. He was an All American in both Greco-Roman and Freestyle wrestling. In college he became an All American four times for two different colleges. Chris Weidman made his pro MMA debut against Reubem Lopes in Ring of Combat in 2009. He won by kimura in the first round. Two months later he TKO’d Mike Steward. In his third fight in ROC he defeated Uriah “Primetime” Hall by TKO in the first round and won the ROC Middleweight belt. After defending his belt once and then signed with the UFC. Chris Weidman made his UFC debut against Italian striker Alessio Sakara on the 3rd of March 2011. 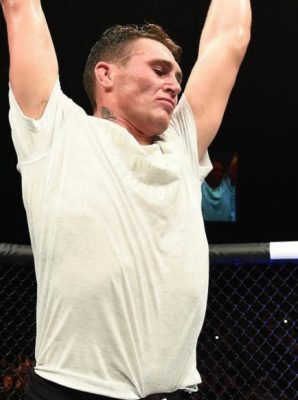 He took the fight on two weeks notice and had to cut a tremedous amount of weight, but still won a unanimous decison over Sakara. He defeated four more foes before he got a shot at middleweight champion Anderson Silva. On the way to the title shot he defeated Demian Maia and Mark Munoz. 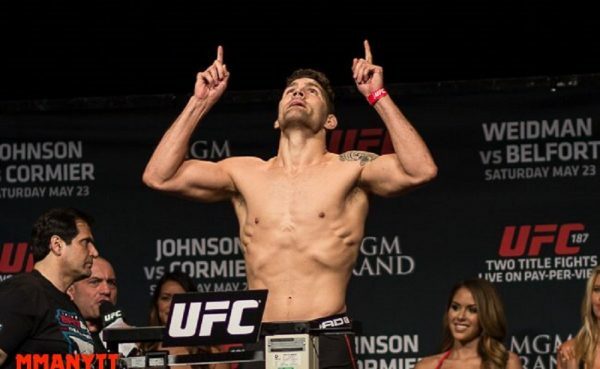 With a pro record of 9-0 Chris Weidman finally got his title shot against the man he got in the sport to beat. Anderson Silva was on a 16-fight win streak and Weidman was a huge underdog. In the fight Silva was clowning Weidman and hitting him with sstrong leg kicks. 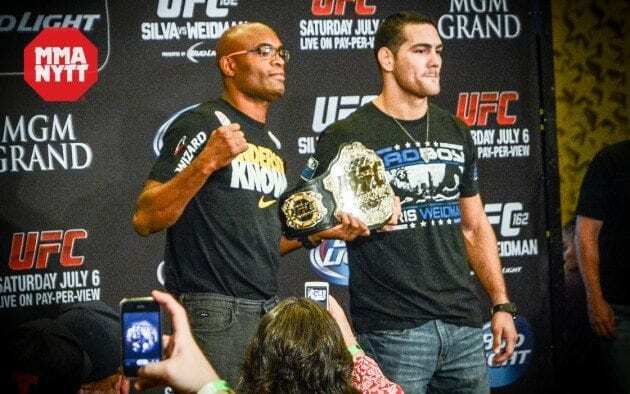 After a back fist stunned Silva, Weidman landed a hard left hook which sent the champion crashing to the canvas, Weidman followed up with ground-and-pound and he was officially the new champion of the middleweight division. The two rematched six months later and Silva was all business in the fight, no clowning at all. In the second Silva threw a very hard leg kik which Weidman blocked perfectly. Silva collapsed in pain and the fight was over. Weidman defended his belt against former light heavyweight champion Lyoto “The Dragon” Machida on UFC 175: Weidman vs. Machida. He won the fight by unanimous decision. He then destroyed Vitor Belfort by TKO in the first round. In his next fight he lost against Strikeforce super star Luke Rockhold. The fight was competitive until Weidman decided to throw a lazy spinning hook kick, which Rockhold used to take Weidman down and land some vicious ground-and-pound. He came back to fight in his home state and on the first ever UFC card in Madison Square Garden in New York. He faced top ranked contender Yoel Romero. The two first rounds were even but in the third Weidman decided to shoot and Romero timed it perfectly with a flying knee. He lost the fight by TKO. He then lost a controversial TKO to Gegard Mousasi after a mistake by referee Dan Miragliotta. In his latest fight he faced Kelvin Gastelum at home at Nassau Coliseum. Weidman used his size, wrestling and BJJ to earn a third round submission, the first time Gastelum had been submitted in his career. At time of writing UFC have no planned bout for Chris Weidman.